The Dino-Lite Premier AM7013MT digital handheld microscope has a 5 Megapixels sensor allowing you to see and record every detail providing you an experience you never had with a digital handheld microscope. It can magnify up to 200x magnification depending of working distance with a resolution of up to 2592x1944. With such magnification and resolution, you will not miss important details under any magnification. The AM7013MT is appropriately incased with an aluminum alloy casing providing robust protection only fit to hold 5 Megapixels of viewing power. It also includes our convenient Microtouch II sensor for on microscope picture taking and built in bright white LEDs to instantly illuminate objects. 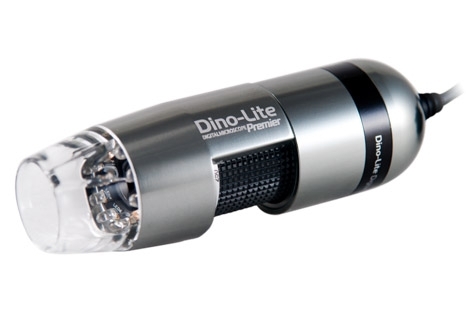 The Dino-Lite digital handheld microscope experience is not complete without the included DinoCapture 2.0 software that allows you to take pictures, record video, and also annotate on images. This model also includes the measurement and calibration capabilities only available for professional models such as this. The AM7013MT with 5 Megapixels sensor allows you to see fine detail in any magnification for an experience you never had with a digital handheld microscope of this kind.